Nankivil's work is found in public and private collections in the United States and Europe, including the Minneapolis Institute of Arts; Frederick R. Weisman Art Museum, Minneapolis; Minnesota Museum of American Art, St. Paul; Scottsdale Museum of Contemporary Art, Arizona; Borusan Contemporary Museum, Istanbul, Turkey; Clinton Foundation, New York; Surdna Foundation, New York; U.S. Department of State, Washington, D.C.; General Mills, Golden Valley, Minn.; Peregrine Capital Management, Minneapolis; Reyes Holdings, Chicago; and Winston & Strawn LLP, Geneva, Switzerland, and many others. 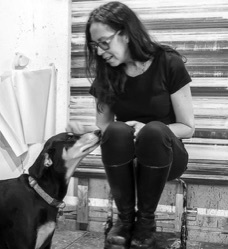 Nankivil is an artist-member of the Traffic Zone Center for Visual Art, a prominent artist cooperative located in the historic North Loop District of downtown Minneapolis, where she maintains her principal painting studio and private press. Lisa Nankivil exhibits her paintings and original prints nationally and internationally, most recently in Lisa Nankivil: Source Material, Recent Paintings & New Media Prints (2016), McCormick Gallery, Chicago, IL, Editions/ Artists’ Books Fair 2016, New York, showing with Highpoint Editions, Art on the Plains XII, Plains Art Museum, Fargo, ND, Delta National Small Print Exhibition 2016, Bradbury Art Museum, Jonesboro AR, On Edge: Hard Edge Abstraction, McCormick Gallery, Chicago, 2014 Minnesota Biennial, Minnesota Museum of American Art, St. Paul.